Q. How can I find the Coming Attractions and Best Sellers? You can find these under the What's New tab at the top of the page. 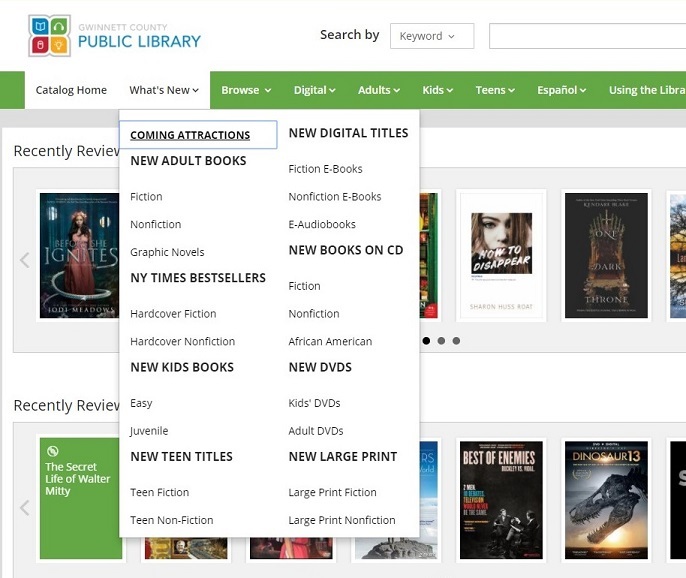 After you click What's New you can click Coming Attractions to narrow your results down to the items that have most recently been added to the collection. Next, you can click the link that says "On Order" to see items recently ordered or "Just Arrived" to see items that have recently been received and are currently being checked out. On the next page, you will see an option to "Filter By" and here you can select Adult for Audience and Fiction for Content and then click Apply. After you have done this you can scroll down to the bottom of the screen and click on "View All New Titles." On the next screen you will see your filters listed at the top of the page but you can use the filters on the left side of the page to filter your results down even further. Here you can select your preferred genre and you can also narrow down titles to the current publication year. You can find the new books in other categories by changing the content and the audience at the beginning of your search as well as the format if you are looking for audiobooks and/or ebooks.